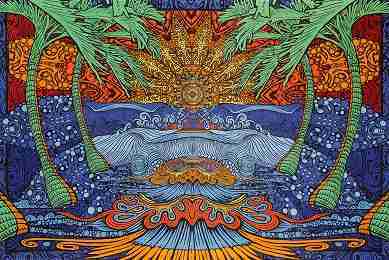 Time for a little psychedelic surfing with this 3D Epic Surf Wall Tapestry. Bring the beach to your dorm or apartment with this intensely cool wall hanging (sand not included). The tapestry measures 60" x 90" and has corner loops for hanging or fastening. Hang it on your wall, use it a festival, or take it to the beach, it has so many uses. Throw on a pair of our 3D glasses, and you better grab hold of your surfboard because it's gonna be one trippy ride!